Pearl Medicare is a fast growing innovative healthcare services provider that is set to transform healthcare services delivery in Kenyan using its M-tibu Platform. We aim to provide not just better healthcare but a better healthcare experience for our customers through exemplary research, education and community outreach. Using our M-tibu Platform we have introduced a new home care service, where our medical professionals provide care at the comfort of the patient’s home. We would like to recruit a dynamic team of independent and highly professional nurses, who will be on call 24/7 to provide home care services to our patients in Nairobi and other parts of the country. They will take vital signs and other basic tests of the patient and with help our team of specialist doctors offer care to patients at home. · Work with other teams including doctors,paramedical staff with available technologies and equipment to provide the best care for the stay home patient. · Ensure excellent standards and quality of clinical and Home based Care services. · Ensure that patient data/ information are handled confidentially at all times. · Ensure effective clinical procedures, rules, regulations which are consistent with organization procedures. · Diploma or Degree in Nursing from a recognized medical institution. 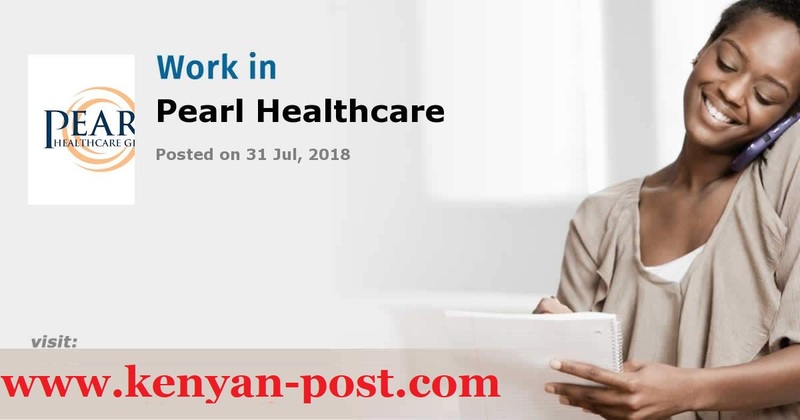 At Pearl Medicare is a fast growing innovative healthcare services provider that is set to transform healthcare services delivery in Kenyan using its M-tibu Platform that enables patients to consult specialist doctors via a video call instantly or at scheduled times. Together with our partners we aim to build the largest network of clinics across the country under the brand M-tibu digital clinics equipped with the state of the art video communication Equipment and high tech diagnostic equipment for patient screening. As our panel Specialist doctor you will be able to have live video consultation with the patients at the remote clinics, request for various tests to be done and uploaded on the Electronic Medical records of platform and be able issue an E- prescription for the patient sent to the clinic in real time. By joining our panel of specialist doctors you are guaranteed start earning much more money which will be automatic sent to your account on a weekly basis. You stand get access thousands of patients from across the county. The more patients you consult the more you will earn! · Diagnose and institute appropriate treatment plans for patient. · Lead the remote teams of paramedics to provide quality patient care using available technologies and equipment. · Ensure the clinic treatment rooms are well equipped at all times. · Participate in home based care programs when called upon. · Degree in Medicine and Specialization degree from a recognized University. · Ability to work with minimum supervision. Having a Current Indemnity Cover of minimum Ksh 5m.